ROSE HILL, Mauritius (Reuters) - Hundreds of gays and lesbians staged the first gay rights march on the largely conservative Indian Ocean island on Saturday, shocking afternoon shoppers in the bustling town of Rose Hill. Mauritius, located off the southeast coast of Africa, has a population of 1.2 million made up of Hindus, Catholics and Muslims. The gay community, which activists say makes up about 10 percent of the population, is mostly underground as many face persecution and discrimination. Wearing wigs and in full make-up, men dressed in sequined dresses, feather boas and high heels led a march down the busy high street of Rose Hill. "The point of today is visibility," said Thierry De Ravel, president of the Collective Arc-en-Ciel (Rainbow Coalition), a gay rights group which organized the march. 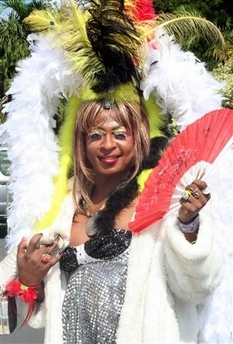 "We want to show Mauritius that there is a gay community, that we want to be out in the open. We want to be respected and we want equal rights for all," he added. Gay rights activists say those who are open about their sexual orientation are often refused jobs or promotions in the workplace and some even face death threats. Carrying hundreds of brightly colored balloons and waving banners saying "Viva sexual freedom!" and "To be gay is not a crime," the marchers danced, waved and handed out leaflets to bemused onlookers. "I must say that I am very surprised to see this," said a local shop owner. "I've never in my life seen such a thing in Mauritius, but I think it's good because we need to be more open and like the rest of the world." Organizers said the event was a victory for gays because permission was granted by local authorities, who have previously stopped such marches from taking place. Rama Valyden, the attorney-general and minister for human rights and justice, said it was a new beginning for gays in Mauritius. "I believe that every one is equal and that no one is superior or inferior to each other," he said. "Today we have a turned to a new page in the history of Mauritius and that is the page of freedom." Valyden is planning to introduce an equal opportunities act in parliament, which will make discrimination against sexual orientation a crime.